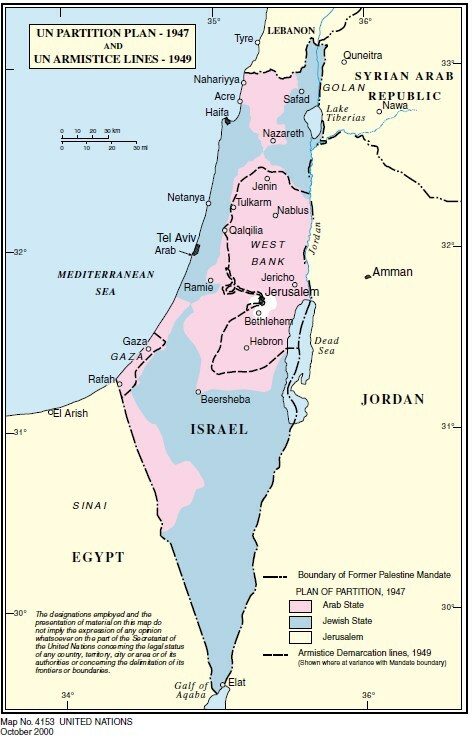 The blue areas constitute the Jewish State, the pink areas the Arab State. Each is divided into three pieces with neutral crossing points between them. Just below Tel Aviv is the port of Jaffa, allocated to Arab State. The white region is the City of Jerusalem, under UN Trusteeship. The map also shows the 1949 Armistice Line (Green Line) which became the de facto border of Israel after its conquest of territories allocated to the Arab State in the Plan.